Forelle Pear Tart – didn’t last long! Time for another recipe (the 4th in a baker’s dozen). This is another that goes great with tea. Be adventurous and give her recipe a try with a pot of the tea named and assess the pairing for yourself. The cook prepared this dish originally as a nice snack for a Girls’ Night at her apartment. Apparently it was so delicious that all her guests could say was “Mmmmmmmm!” ’cause their mouths were stuffed with pear tart. A simple combination of frozen puff pastry, Forelle pears, orange juice, butter, and brown sugar turned into something superb at the hands of a young woman who knows food! 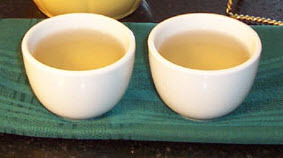 Dong Ding Oolong (also called “Tung Ting Oolong” and “Frozen Summit Oolong”) is a Taiwanese Oolong. The tea in dry form is in little rolled up “nuggets.” After steeping, the full story is revealed with lots of full leaves, some large pieces, and some two-leaves-and-a-bud pieces. Oolongs are partially oxidized, with this one looking closer to green than black, meaning it was lightly oxidized (usually 20-30%). The history of this tea goes back to the Fujian Province of China, where the original tea plants are said to come from. In 1855 some Cing Shin Oolong varieties of Camellia Sinensis were planted near the Dongding village in Taiwan. The tea has since that time developed quite a reputation. It can undergo a number of infusions with flavors that are mild, not bitter, and with no aftertaste, with some floral notes and even a slight tang. A perfect “pearing” with that fruity tart! Hope this works for you. Feel free to comment here with your experience, and watch for the next pairing to be posted in August. Herbal Infusions Are Teas, Too!